As shown, the lower February 2016 value for the global temperature anomaly is +0.92 deg C referenced to the years of 1961-1990. This was exceeded by the upper January 2007 value of +0.98 deg C. Just in case you’re having trouble seeing that in Figure 1, see the graph here, which starts the data in January 1997. 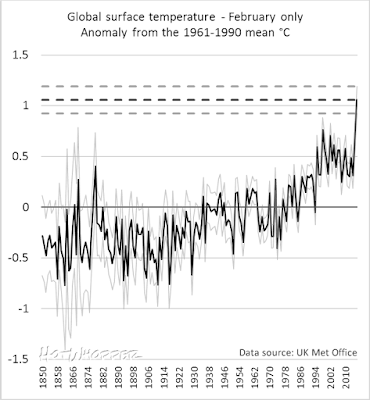 So the best the alarmists could claim, according to the HadCRUT4 data, is that the February 2016 global surface temperature anomalies may or may not have been the highest on record when considering the uncertainties of the data. Seriously? Poor Bob is really stretching. The fact is that it was the hottest February on record. There was no other February that came close, not within the widest 95% probability bounds. 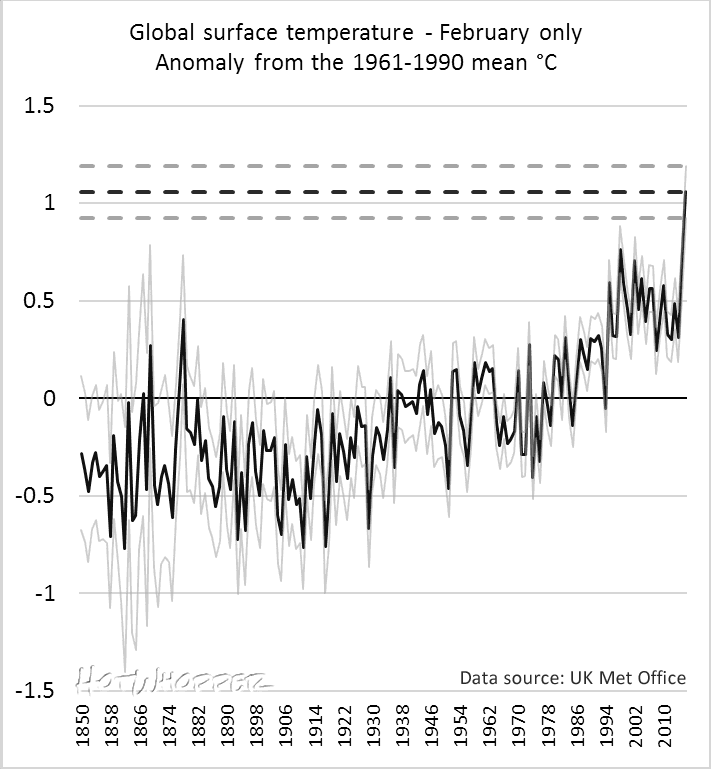 According to the Met Office Hadley Centre, the February was hotter than the average of 1961-1990 by 1.057 +/- 0.136 °C. Incidentally, Bob really didn't need to scour the records to find another month where the uncertainty ranges of the monthly anomalies overlapped. They didn't just overlap in January 2007, they also overlapped in every month from August 2015 to January 2016. It's been getting very hot lately. Bob continues to peddle his zany notion that global warming is "natural" - that is, it's getting hotter because it's getting hotter. Also known as "it's magic". He stopped short of trying to claim that all the warming of the past 65 years is "magic" - he probably knows that would sound ridiculous, even to the climate hoaxers at WUWT. There was the usual nonsense being spouted, not just from Bob Tisdale. So the most that can be reasonably claimed is that temperatures continue to recover from the last ice age, and that we haven’t entered a new one, yet. 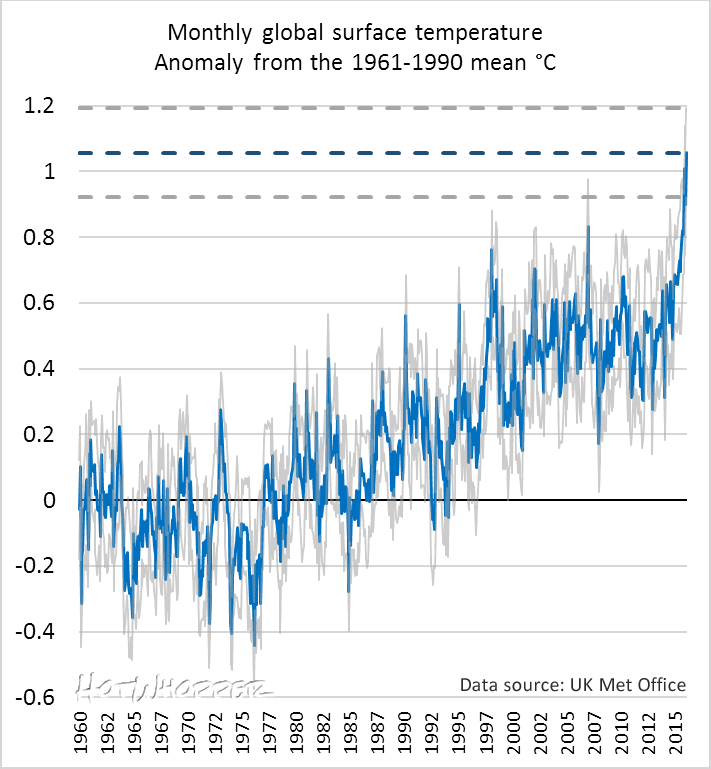 Global average temperature is meaningless. It’s propaganda, a measurement of global average temperature has no scientific value unless accurately knowing the global average temperature is the scientific goal. Other than that it is a useless value. Belief trumps data. A person can even lose jobs over this established human trait. The data can demonstrate completely the opposite case, yet belief will triumph over it more often than not. Those who show data with detached examination are rare and often not well-liked. And frequently unemployed. Bob T, when Trump or Cruz is elected as POTUS, I will put my vote in for you as nominee for Science Advisor to the president ! I am sure your vast knowledge will be needed to rid the U.S. of all the $#^& Holdren has covered the White House in…. ( Just because I’m half Canadian does not make me bias in my choice )..Never stop ! Heh. Reading the comments they're split between it being natural and it being a conspiracy. You'd expect such a split to show up some in fighting but that doesn't seem to be the case. I ran the numbers and got that there's about a 1.3 % chance that January 2007 was more anomalously warm than February 2016. I got 5.4% using a median of 0.832 and 1.057 °C, standard deviations of 0.072 and 0.068 °C respectively. Assuming Gaussian distributions, the point of intersection is 0.948 °C with a cumulative normal distribution of 0.054 under each tail. What I posted on WUWT, at least for now. 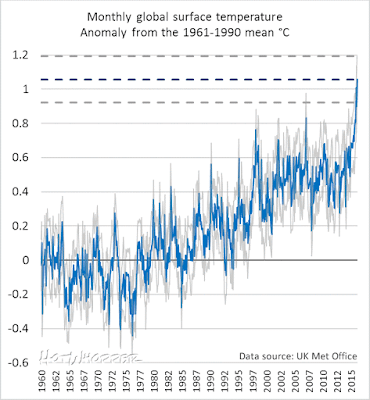 "So after combing through the 1993 (one thousand nine hundred ninety-three) other months in the Jan. 1880-Feb. 2016 HADCRUT4 series, Mr. Tisdale identified a single month with a 5.4% statistical chance of having a higher temperature anomaly than February 2016 (and with that month occurring just nine years ago). Talk about grasping at a very, very thin straw." While Sou is correct that Aug 2015 - Jan 2016 also overlap with Feb 2016 at the 2 sigma level or greater, that period is inconvenient for Tisdale's desired conclusion, namely that recent months and years are nothing special. Correction: Jan 1850 to date, not Jan 1880. Of course he corrected for running 1993 statistical tests too. Right? ...uhhh, wrong. That never appears to have occurred to Bob. Should we help him by pointing out the odds of NOT finding a significant result while running 1993 independent tests at the .05 level? Or by showing him how to correct for autocorrelation to get an even better estimate? Nah. It's not like he'd understand if we did. Kind of like comparing apples and giraffes. At WUWT Nick Stokes also considers the probability of the 2007 'high tail' and the 2016 'low tail' events occurring jointly so that the 'true' value Jan 2007 > Feb 2016, which reduces the probability to P1*P2, or <<1%. This is one of those very basic points that you have to ponder for a while, but I think he's correct. Did he correct for all tests he implicitly ran by cherrypicking? No. m(P1-P2)/s(P1-P2) gives you the z-score and then you can convert that to a one-tailed p value. This is early first year undergraduate stuff in a typical science course. I think it's simpler and more intuitive than the correction needed for cherry picking (which is also necessary, and squashes the p value). So I'd expect that any adult claiming moderate competence should be able to follow the calculation I did to come up with about 1 % chance that January 2007 was more anomalous than Feb 2016. In, say, 150 coin flips is finding a series of 8 heads in a row a 1/2^16 probability? A standard early first year undergraduate exercise in stats is to have half the students in a class produce "random" distributions of coin flips by hand and the other half produce random distributions by actually flipping coins. It is trivially easy differentiate the two as random distributions do, in fact, contain "improbable" runs. "Improbable" runs which are completely probable given the number chances, that is. That's 1/2^8. Edited in midstream. How often do you hear from science deniers "what are the chances of that happening"
Yes. A truly empty, rhetorical statement. And further to this point I have NEVER heard a denier ask: "What are the odds of finding a significant trend in the years including and following a cherrypicked 3.1 sigma (p <.001) event which the 1998 el Nino was?" Or equivalently: What are the odds of seeing the true 50% heads and 50% tails distribution of a fair coin in a series of 30 coin flips if I intentionally start out with an observed sequence of 10 heads--a bit over a 3 sigma event as well? Depends on the meaning of "about", but the odds of seeing the true 50-50 distribution are low. The expectation is that you'll see a 67% H-33% T split. Such are the joys of cherrypicking for deniers. "What are the odds of finding a significant trend in the years including and following a cherrypicked 3.1 sigma (p <.001) event which the 1998 el Nino was?" Interesting approach. My immediate objection is that, unlike coin flips, period-to-period temperature variability isn't independent of prior periods. Unfortunately my stats aren't good enough by far to account for autocorrelation with an appropriate model, or even opine whether not doing so would give a materially different answer over an interval as long as 1998 to present. I should have read down further ... looks like I need to go read Tamino. Tamino has addressed cherrypicking many times in the past along these same lines, though usually uses more graphic methods. Tamino, and a Durbin-Watson test as well, also note that autocorrelation is largely, though not completely, removed by going to an annual aggregation as I do here. Aggregating annually, and therefore ignoring the 2016 spike to date, RSS gives a trend of .12/decade and a resid error of .1367. 1998 gives a resid of .43039 making it a 3.1 sigma event. INTENTIONALLY, after the fact, then starting your analysis at 1998 simply because it gives you an insignificant run later is implicitly a multiple comparison of at minimum every possible run of 18 years (and likely worse as deniers are willing to find any run of any length that shows what they want). Therefore you must drastically adjust the alpha to account for this. Deniers never bother with this last step for obvious reason it would show the error of their "logic". See Bonferroni or Scheffe, for example, for specific adjustment procedures. Or just look at "the Escalator" which uses NASA data http://www.skepticalscience.com/graphics.php for a nice graphical example. I should have mentioned that one could also construct an equivalent correction procedure that would correct the alpha probabilities (i.e., drastically widen the error bars due to multiple comparisons) in the cherrypicked coin flip case. Something happened to a post. Briefly, by aggregating annually (thereby ending at 2015), autocorrelation largely disappears. Tamino mentions this and Durbin-Watson lag 1=p of .5. RSS gives .12/decade. Residual error= .1367. Residual of 1998 works out to 3.1 sigma. By INTENTIONALLY going inside and looking for significant/insignificant periods one must correct for the number of comparisons being made. Every 18 year sequence at a bare minimum in this case and likely more given denier penchant for accepting any negative evidence at all. This means you must drastically increase the alpha level to control for all the comparisons. Tamino makes same points re cherrypicking, though usually through graphical methods. I am new at this site, but who is Bob Tisdale? Is he a real person, or is he just a psevdonym for "Team Tisdale," who consists of several persons with Scientific knowlegde, who always seems to have a ready answer to every Challenge the Deniers meet. The reason I ask is that the writing style and reasoning seems to differ from post to post. And beeing in the climatedebate for only one year, I feal the urge to develop a conspiracy theory my self. Synpathy is not the right emotion, but Tisdale has accepted the desperately onerous and unpleasant job of being Anthony's Chemical Ali in the face of reality's merciless attacks (on all of us) from all directions. The stress that Tisdale suffers is obvious and it's reality's fault but it's amplified by Hot Whopper never letting him get away with blaming the toilet seat. Sou...your furry little friend marcus has been placed in moderation by the proprietor of that pseudo-science blog. He was the one who posted the first dog-whistle anti-semitic comment. And he seems to post a lot about Agenda 21 and other silly stuff regarding imaginary conspiracy theories. If I didn't know better I would swear he was a parody account. No luck on that one, Emeritus. There was a conspiracy theory doing the circles about a year or two back that 'Bob Tisdale' was a pseudonym/sock puppet, but it turns out that it's his real name. He's still boring nonetheless, always churning out tl;dr 5000+ word screeds that essentially repeat the same thing over and over again: the warming is caused by heat moving around in the system. At least, that's our best appraisal of it. Ah well, I suppose I'm not much good at expressing pseudo-scientific concepts in terms that rational people can grok. But I'm sure that in Bob's head it all makes perfect sense. Anyway, for all the AGW deniers go on about the laws of thermodynamics being violated by AGW theory, perhaps someone should try to explain the 1st law to Bob. Hint for Bob: Earth ain't a closed system. "Bob T, when Trump or Cruz is elected as POTUS, I will put my vote in for you as nominee for Science Advisor to the president ! I am sure your vast knowledge will be needed to rid the U.S. of all the $#^& Holdren has covered the White House in…. ( Just because I’m half Canadian does not make me bias in my choice )..Never stop !" Have You seen his Picture, is he just another weather man, how can this person get all this influence without some competent apperatus. Forget the first and second Law of thermodynamics, that's far beoynd the impact area of WUWT. I laughed until I hurt when I read Tisdale's article. seaice1 nailed him, and Tisdale reacted with some of the purest jabberwocky I've read in ages. It was a bit depressing to see how quickly seaice1 got labelled a troll. Just a heads-up to readers here, that Tamino has calculated the odds of both the upper value for 2007 and the lower value for 2015 coinciding as 0.013. Bob insists on getting his education in public. He has a good teacher in Tamino, but I doubt whether Bob is up to the task of being a good student. Looks like Tamino took my approach and got the same number. As jgnfld points out, even that massively overestimates the chance that Tisdale's right. and as I posted one there, the chances are just the same that the Jan 2007 temp was in fact lower than measured and Feb 2016 was actually quite a bit higher than +1.057. In all fairness, I see that Bob has now published an 'update' (albeit a little begrudgingly) where he acknowledges Nick Stokes' re-interpretation of the overlapping error range. Maybe it isn't a complete waste of effort to respond with logic to posts on WUWT? OK, yes, I'm probably dreaming. It's good that Bob Tisdale's acknowledged he was wrong this time around. However despite what he claims (archived here), that's very rare. He's never published corrections to his claims that it's blobs and El Ninos that are causing global warming for example. And he lies when he says that "alarmists" don't correct mistakes. They are usually the only ones who do. Pfft. Until Bob changes the headline, the 'correction' is of little value. The clown posse has moved on, anyway. Nick, I think anyone still deserves encouragement for correcting previous mistakes. The update was also put clearly at the top of the article, so fair play. And I'm very surprised.